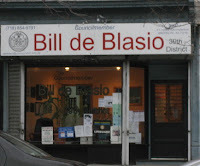 I gotta give some praise to Bill de Blasio and his people. I emailed his office today and got a response today! I'm scheduled to meet with a representative next week. In the meantime he sent me some information to pass on to all of you. -Discuss future disruptions in service and street closings. -Answer questions and address project concerns. provide service at Kensington Station. -Ask for signatures to petition for a new USPS station or finance postal unit for 11218.